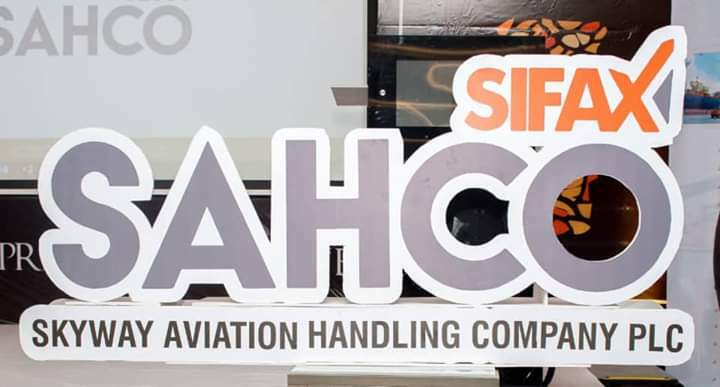 an aviation ground handling company that offers services like passenger handling services, ramp handling services, cargo warehousing, crew administration, VIP lounge services and other related aviation ground handling services, over the weekend unveiled a new company logo, while also appreciating all its clients for their patronage. The new Corporate logo was unveiled by the Vice Chairman of SAHCO, Barrister Chike Ogeah. who represented the Chairman of SAHCO, Dr Taiwo Afolabi ( MON) in his speech expressed pride at what the company represents which includes safety,speed and efficiency. Mr. Basil Agboarumi, the Managing Director/CEO, SAHCO, during his specch at the special dinner organised for clients in Lagos promised to deliver quality and improved ground handling services to all its clientele across the nation’s airports, urging all to invest in the company by buying its ongoing shares in the market. Various participants from airlines and cargo sub-sector, lauded the ground handling company for improving aviation ground handling business in Nigeria and assured the management of their utmost loyalty to the company. Mr. Murat Ozcan, Vice President, Ground Operations, Arik Air, in his feedback comment, said that without SAHCO, the airline would have been in a bad state. He said: “We have been with SAHCO for five years and we have been everywhere in the country with the company. The dedication, passion and commitment to the job from bottom to the top in SAHCO is wonderful. Also Mr. Getmet Hiwat, Country Cargo Manager, Ethiopian Airlines, described the company as a wonderful company worthy of emulation. Besides, Mr. Percival Uwechie, Airport Manager, Etihad Airways stressed that the airline had been with SAHCO since operating into Nigeria. “I want to congratulate the management for continually discharging quality services to its clients. It has been a honor working with SAHCO and even if we had any other choice, we won’t do it differently. Mr. Chris Paul of Ajulo Cargo said that with the distinction created for itself by the company, SAHCO’s shares would be a sold out. Mr. Kingsly Nwokoma, the Managing Director of Cargolux, also lauded the company for its futuristic approach by expanding its warehouses even when there was no need for that. He observed that SAHCO had an excellent team, which had been working harmoniously with the clients over the years and urged the management to sustain the current approach. 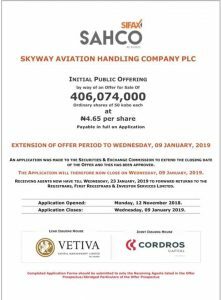 Mainwhile the Securities and Exchange Commission earlier approved an extension of the offer period of Skyway Aviation Handling Company Plc’s Initial Public Offering. In a statement signed by the Head, Listings Regulation Department, Nigerian Stock Exchange, Godstime Iwenekhai, the offer for sale of 406,074,000 ordinary shares of 50kobo each at N4.65 per share of SAHCO has been extended to January 9, 2019. The statement said SAHCO obtained SEC approval to extend the offer period of its IPO by 12 working days. The Chief Executive Officer, NSE, Oscar Onyema, during the company’s ‘Facts behind the Offer’ ceremony in Lagos, said the Exchange was excited about the IPO, adding that the nation’s stock market had not seen an IPO in four years. He said SAHCO’s interaction with the market was welcomed and that the success of the IPO would provide and lead the way for future privatisations and IPOs on the Exchange. 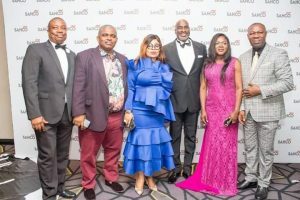 Caption: L-R: Executive Director, Cargo Services and Operations,Skyway Aviation Handling Company PLC ( SAHCO),Mrs Boma Ukwunna; Managing Director/CEO, SAHCO, Mr Basil Agboarumi; Non- Executive Director, SAHCO,Dr Oluropo Owolabi ; Vice Chairman SAHCO, Barrister Chike Ogeah; Non-Executive Director, SAHCO, Barrister Kayode Filani;Executive Director, Sales and Marketing, SAHCO,Mr Olaniyi Adigun as the new corporate logo is unveiled at the Clients Appreciation Dinner.